We have looked at trade cards in a previous blog and if we’re honest this post is slightly self-indulgent as we’re fascinated by them. Today we thought that we would focus on the trade cards for those women who chose to run their own business or were forced out of necessity to continue running their husband’s business after his death as they would most likely have no other source of income. We have previously looked at Eleanor Coade, businesswoman extraordinaire, a force to be reckoned with and we have our very own ‘Georgian Heroine’ Rachel Charlotte Williams Biggs, who, whilst not running a business in the way you would expect, lived life on her own terms in a male-dominated world. She was paid by the government for her work as a sort of spy, reporting back to them about life in France around the time of the French Revolution and organising the major event of the golden jubilee for George III, almost single-handedly such. So, women were not all sitting around gossiping and drinking tea, looking pretty and waiting for ‘Mr Right’ to sweep them off their feet. 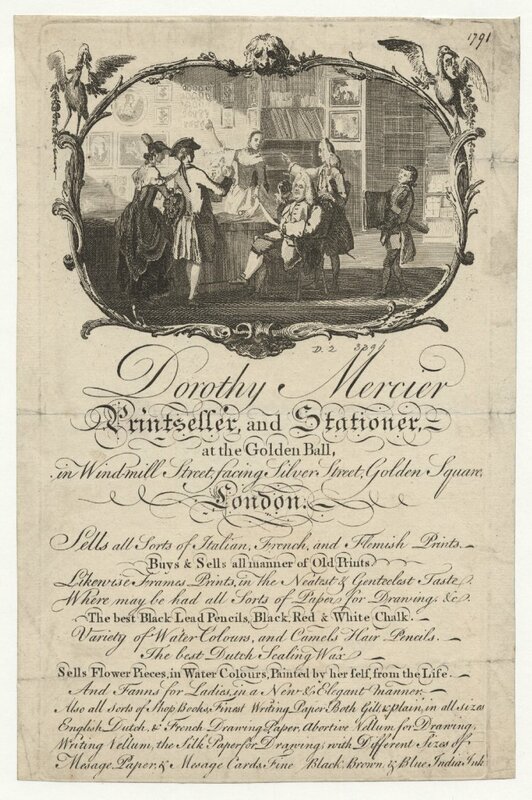 Women have always run businesses and in the eighteenth-century having your own business card and advertising in the newspapers was an excellent way of self-promotion, so we’re going to take a look at some such cards. 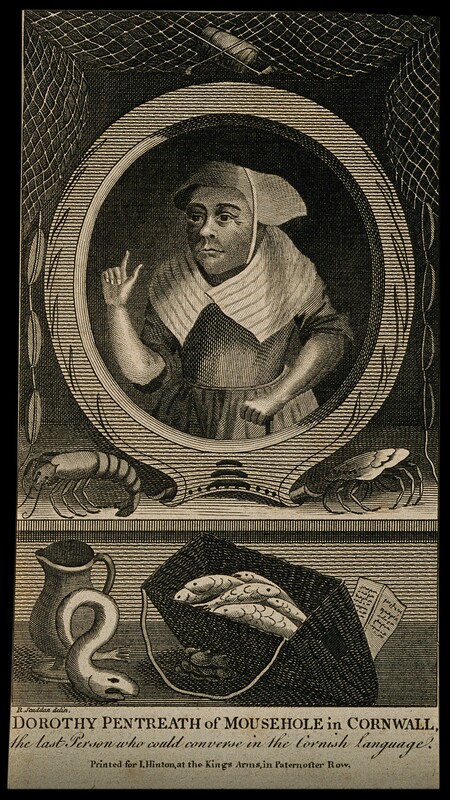 Our first and the earliest and most unusual card we found is for Dorothy Pentreath (1692-1777), known as Dolly, as her trade card states; she was ‘the last person who could converse in the Cornish language’ – she also sold fish for a living. Dolly was apparently not averse to cursing people in her native language when annoyed, oh and was possibly a witch! So multi-talented – quite a woman it would seem. 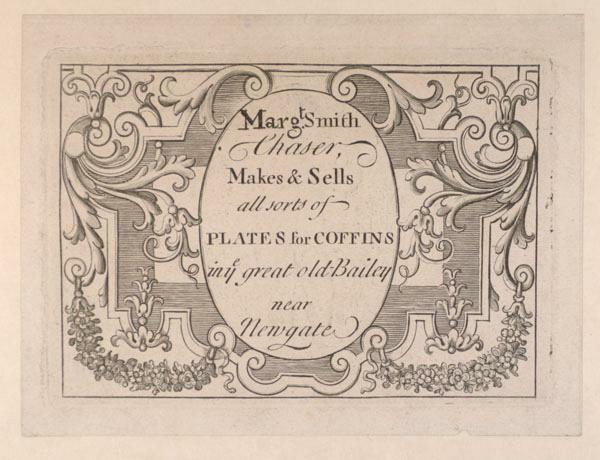 There are many for occupations traditionally associated with women, such as fabric and frock sellers, but we wanted to look at the unusual ones, so our next offering is a seller of plates for coffins, near Newgate, London. 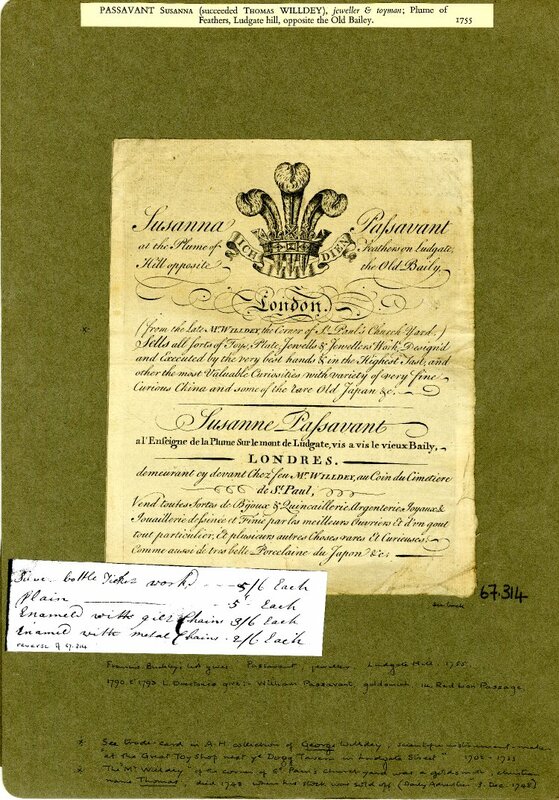 Susanna Passavant took over a going concern from the late William Willdey, jeweller and toy man, Plume of Feathers, Ludgate Hill, opposite the Old Bailey. 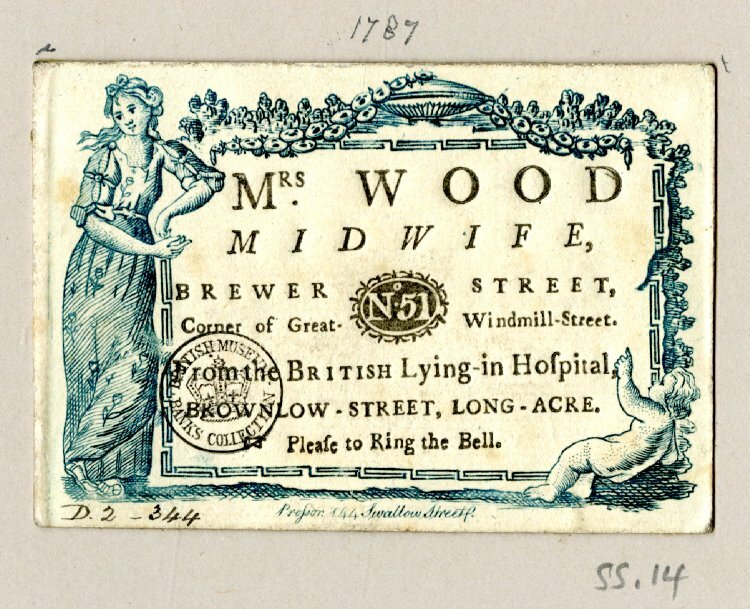 Next, we have one for Mrs Wood, a midwife in 1787, whilst a common occupation, this is the only trade card we have come across to date, for a midwife offering her services. Sarah Greenland, tobacco and pipe maker, who was possibly also an exporter of her goods. 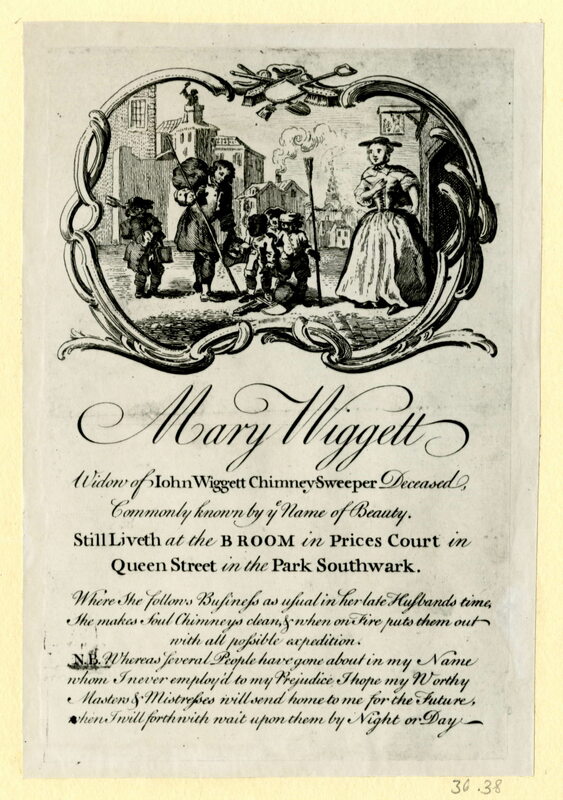 We love this next one, Mary Wiggett, chimney sweep. Mary took over the business after her husband died and remained at ‘The Broom ‘. Her unique selling point was that she would ‘make foul chimneys clean, and when on fire, puts them out with all expediency’. This next one is quite sad. This was dated 19th June 1830, Martha Banting of Bampton, Oxfordshire was notifying people that her son John was no longer a part of the business, but that she would continue trading alone. On the 26th June 1830, Martha wrote her will – it was proven on the 28th July 1830. Despite her demise, her children inherited the business, so hopefully, they continued trading under the Banting name. Our final offering is Dorothy Mercier, printseller, stationer. Dorothy née Clapham was the widow of the artist Phillipe Mercier (1689- 1760). She would buy and sell old prints and frames. She also sold writing paper, vellum, drawing paper, lead pencils, chalks, paintbrushes, watercolours, so she would have been very popular with the artists of the day. Oddly she also sold ladies fans. She was also something of an artist as she was selling her own paintings of flowers too. Quite the entrepreneur. I love this! Where do you find these trade cards? Are they all digitised somewhere? I especially like Mary Wiggett complaining, in her card, about the people who’ve been going around pretending they are her. I imagine she had a good reputation, if rival chimney sweeps wanted to steal her identity. an eclectic selection of trades! the number of women in business is also reflected in the advertisements in the newspapers, many of them in the fashion business one way or another, but not all. Yes, for sure. It’s good to see that women weren’t just working in the widely acknowledged occupations of the day. These are fabulous, I can see why you love them. I think Dorothy Pentreath should have sued the artist though, as she is depicted with no neck and what looks like a flounder on her head. I have seen many trade cards in my career, presumably all for men. But even if a woman did not have a husband at all, or did not expect her husband to secure her position in society, I assumed that a woman would not put her own name and face on a business herself. 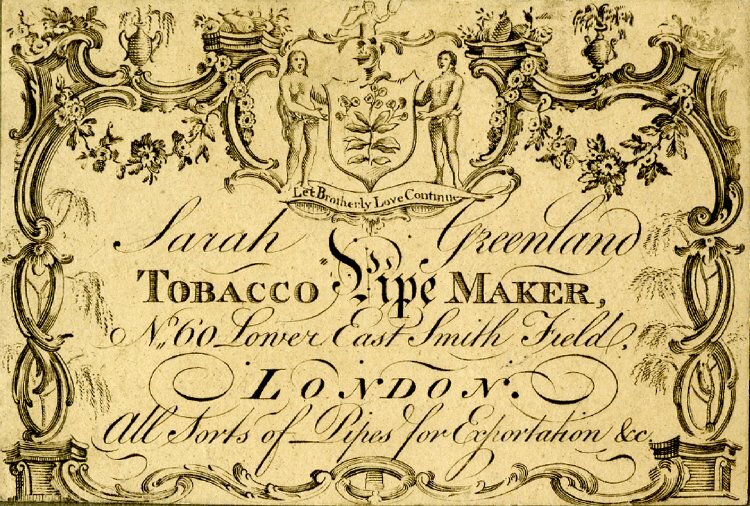 Hopefully Sarah Greenland, tobacco and pipe maker, was indeed also an exporter of her goods. That would have been a sign of great success! The Sleepe sisters, all of whom were fan-makers and one of whom was Frances Burney’s mother, each made a trade card. Copies survive in the British Museum, where they are in the online collection. My article on the Sleepe family is in the current issue of Eighteenth Century Life (https://read.dukeupress.edu/eighteenth-century-life/issue/42/2). Other online trade caard collections include the John Johnson collection at the Bodleian, Oxford and the Lewis Walpole Library at Yale. No business cards, but my absolute favorite 18th century woman entrepreneur was Mary Katherine Goddard. Mary Katherine Goddard (1738-1816) was a trailblazing newspaper publisher, as well as the first female postmaster in colonial America. But what makes this independent and courageous woman truly extraordinary is that in 1777 she printed the very first copy of the Declaration of Independence that included all of the signers’ names. Her name was also included at the bottom. Thank you for sharing these cards. It is inspiring to see how women were able to make a great name for themselves in various trades in the 18th century. Bravo to our ancestor women folk!